If great songs are currency then Angel Snow and Matthew Perryman Jones are well and truly in the millionaire set. Add in the capacity to present their compositions in such an engaging and enthralling style leaves you pondering with the thought that many more people should be hooked into their music. 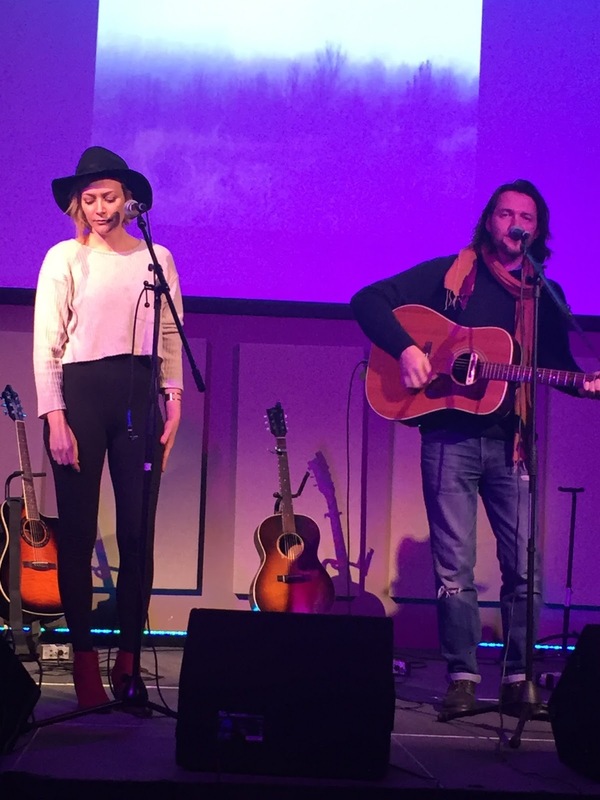 Around a hundred folks in Bewdley this evening were not guilty of missing out as these pair of finely tuned singer-songwriters meandered their way from Nashville Tennessee to a sleepy town in North Worcestershire. The local promoters continue to spearhead an impassioned project to raise awareness of highly crafted music and they successfully unearthed a couple of gems for this month’s show. In contrast to Angel’s last UK tour, which also took on a co-headline format, a sensible decision was made to give both performers the breathing space to deliver a solo set, with just a few fleeting moments of collaboration. 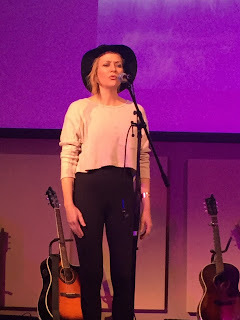 Twelve months ago Angel performed more of a songwriter’s circle co-stage show with Ben Glover which worked as both artists possessed a reasonable profile in the UK. As this was just Matthew’s second trip and he was admittedly unknown in many quarters, it was very useful to grasp his skills from an extended and concentrated view. The positive result of this approach to the evening was that each artist flourished on their own terms, whether basking in the beautiful vocals Angel wraps round her songs or the gripping way in which Matthew shares the fruits of his talent. Angel had arranged to play the opening set on this short tour and thus get first bite at freezing an audience’s attention with a paradoxical warm glow. Midway through her set, the stunning ‘Lie Awake’ gets its inevitable airing showering deep thoughts of where on earth this spine tingling song got its inspiration from. The flow, mood and elegance of this song profusely captured the moment with Angel herself giving a glimpse into its inspiration. Obviously those knowing a little of Angel’s background were not surprised to hear of the Alison Krauss connection with ‘These Days’ also making a welcome appearance in a set list that was occasionally improvised on. From two songs which showed that Angel’s writing can turn the heads of the big stars, we were brought up to date with ‘Secret’ from her latest EP and a song called ‘Disguises’ slated to be on her new album which is likely to emerge later this year. Older songs such as ‘Coals and Water’ and ‘Holiday’ also made welcome appearances during Angel’s time in the spotlight, but these were probably eclipsed by a newer tune in the sublime ‘I Need You’. There has been plenty of indication that Angel is going to delve a little more into an indie rock sound with new material, but this evening was all about the acoustic presentation. Perhaps the merits of what is the ideal role for Angel can be debated when sufficient contrasting sounds appear, however her emotional approach to song writing will prevail and don’t expect too many upbeat happy numbers. 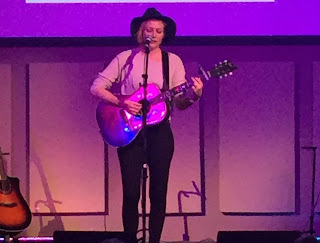 This is what makes Angel Snow admired and after getting further exposure via the ‘Back to Beth’s’ house concert documentary that Bob Harris presented on BBC TV last year, this current tour is enhancing her credibility. 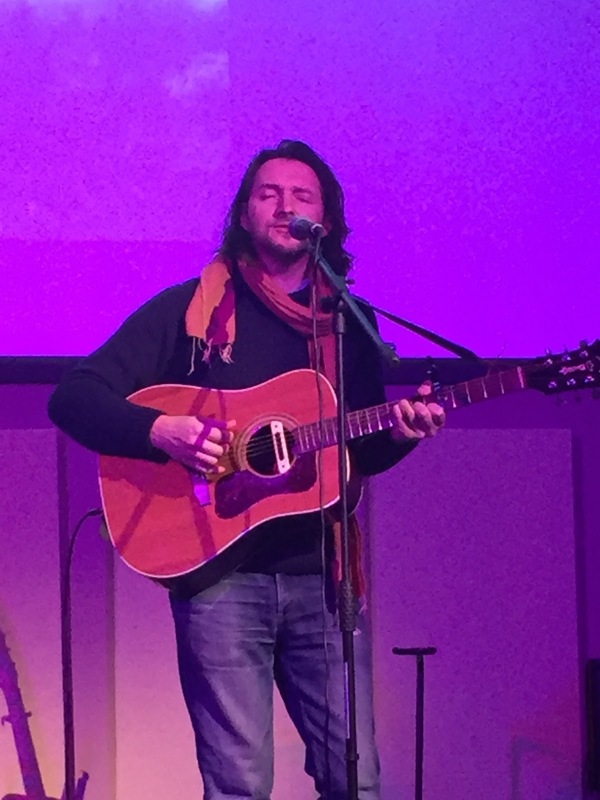 We were briefly introduced to Matthew Perryman Jones when Angel invited him to join her on ‘Secret’ and after the break he commandeered the spotlight himself to reveal the heart and soul of a songwriter. Matthew’s first UK trip a couple of years ago was supporting Mindy Smith and this time his focus was to promote his seven-track mini album COLD ANSWER. No sooner was the set underway and Matthew referred to the TV series based on his hometown with fond memories of his song ‘I Can’t Go Back Now’ being used. However we did learn that Matthew was more aligned with the true grit of Music City rather than superficial presentations, thus positioning himself in the ever growing camp of those writers avoiding the scramble for that compromised Music Row cut. Also revealed was a songwriter forever searching the ultimate inspiration of that perfect song with the background to ‘Waking the Dead’, ‘Table for Two’ and ‘O Theo’ spawning deep origins. Whether seeking retreat in Illinois, linking the twin subjects of love and gambling or peering into the artistic world of Vincent Van Gogh, Matthew dismisses the song writing boundaries. One of the framed moments from his almost hour-long set was a rendition of an older song ‘Save You’, with Angel getting the reciprocated invitation to share the vocals. On an evening of a split bill intrinsically linked by moments of entwined authenticity, Angel did remain on stage to join Matthew for the two finale numbers which saw these two esteemed singer-songwriters ease into the world of their fellow luminaries. A gorgeous version of the Tom Waites song ‘Take it With Me’, a previously covered piece from both artists, sprinkled some gold dust on an already hefty collection of songs, before a fun singalong of Springsteen’s ‘Hungry Heart’ ensured the audience could add a light hearted conclusion to a seriously impressive evening. Unfortunately the delayed arrival to St. George’s Hall meant the opening set by local performer Elisha Green was missed, but on all accounts the reports were good and once again substantiate the fine job the promoters are doing to furnish the community with opportunities to enjoy quality music. This was a second visit to the venue after the successful Dreaming Spires gig last year and this enhanced turnout highlighted the momentum the shows are gathering. It also helps when you acquire the services of artists the calibre of Angel Snow and Matthew Perryman Jones for the evening. It was a case of the better artists of Nashville being transported to the better listening audiences of the UK with all the factors of a gig to savour flourishing to the maximum extent.